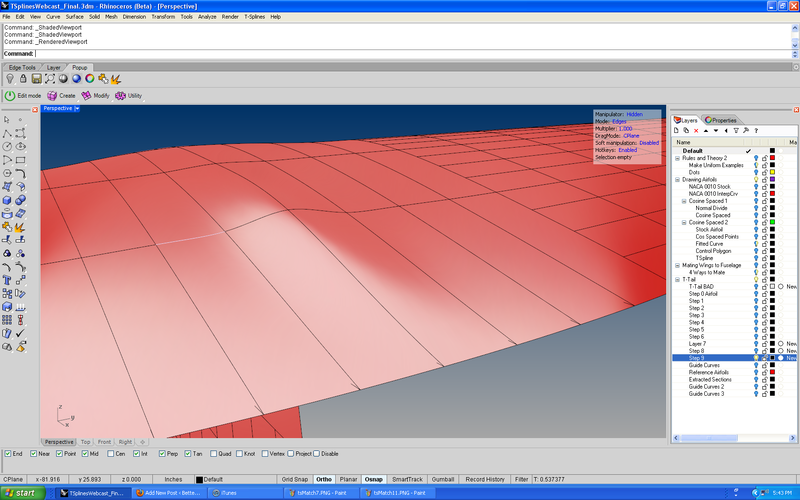 For those of you who made it to my webinar hosted by T-Splines on the 26th of April and want to review the material, or for those of you who missed it, the archive of the webinar is now live on the T-Splines website. Click here to view. If you’d like to download the file that I used for the presentation, you can download it here. 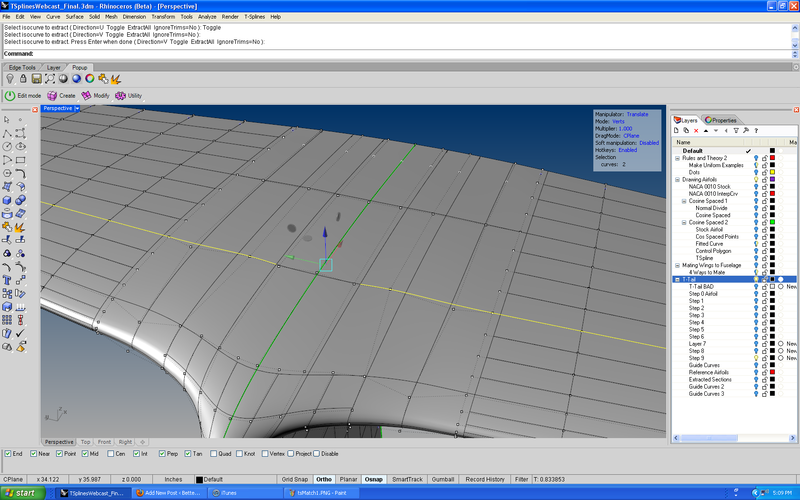 You can guess where this is going next – I’m going to blend those two curves. Just make it pretty, whatever setting makes you happy. Don’t join your blend to the input curves. 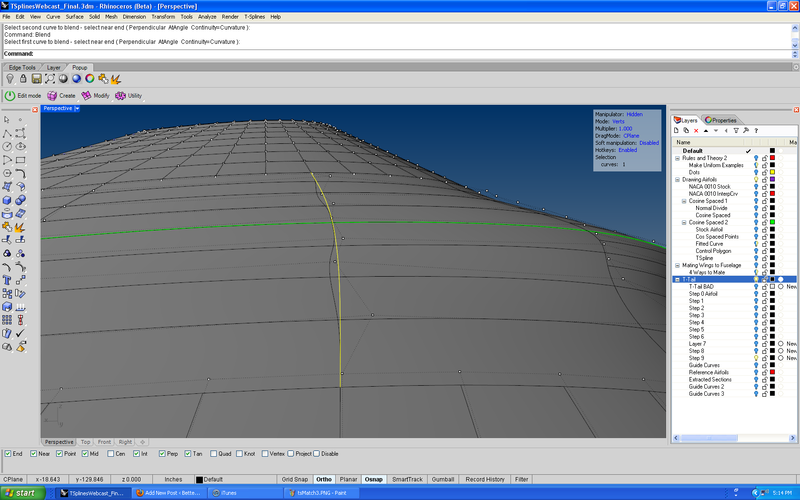 Now wouldn’t it be wonderful if we could get our T-Spline isocurve to follow that nice curve? Okay, no problem! Run the tsMatch command. Notice there is an option called “Midsurface.” In fact it’s the only option when the command is run. Click that. 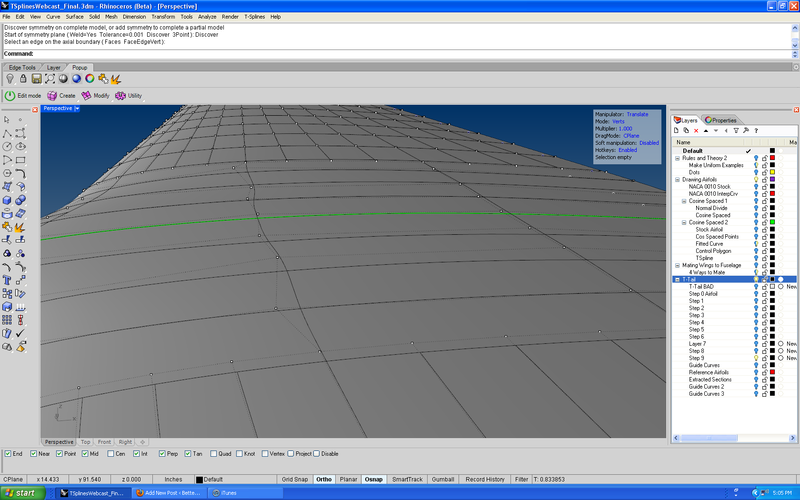 It asks you to select a T-Spline border edge loop to change. 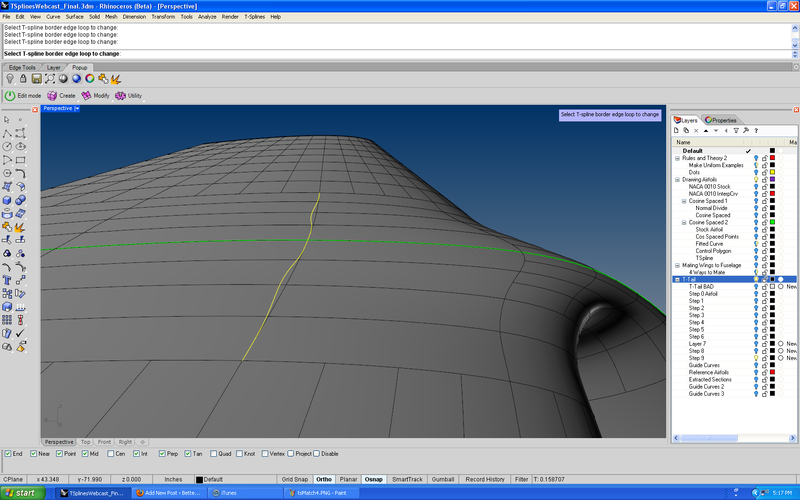 Ignore that “border edge loop” part, just click on your bendy T-Spline isocurves. Hit enter, then it will ask for the curve to match it to. 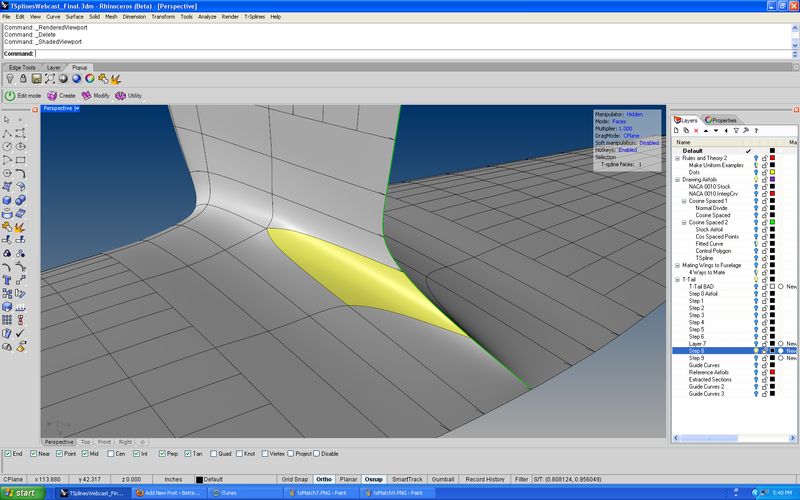 Give it your nice blend curve and hit enter. You can see where it has highlighted the bad isocurve, and where it will be pulling it into the nice blend curve. I’ve just been using the default settings so far with great results, so go ahead and hit enter. Ta da! Can you believe that? I couldn’t either. Now, this is good. I mean really good. But here’s how it would be even more amazing. Part of why this worked so well for me the first time was because my T-Spline isocurves were already pretty darn close to this state just from point editing. By doing this, since you’re working with a degree 3 surface, making this isocurve nice and tidy will inevitably make the adjacent ones a bit wavy. You can keep going back and forth a bit, and get it perfect. 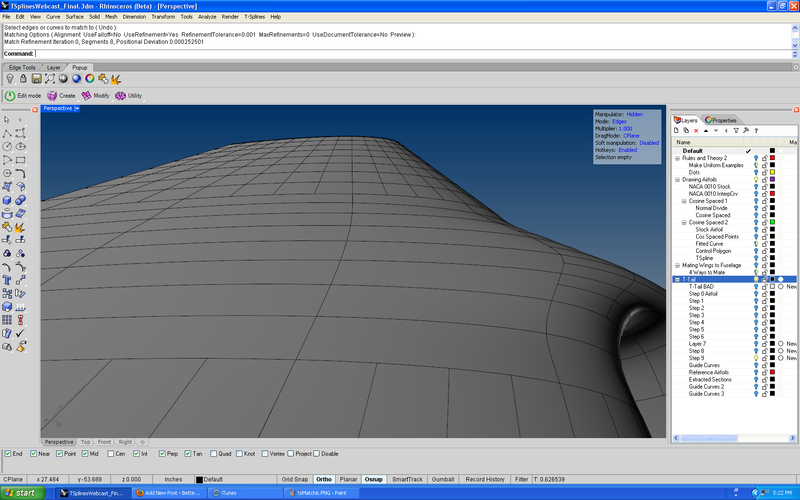 I spoke with Matt at T-Splines today and suggested that they implement a “Multiple Matches” option, which is something that the Rhino MatchSrf command does have. He seemed to think it was immanently possible, but will get back to me later this week. 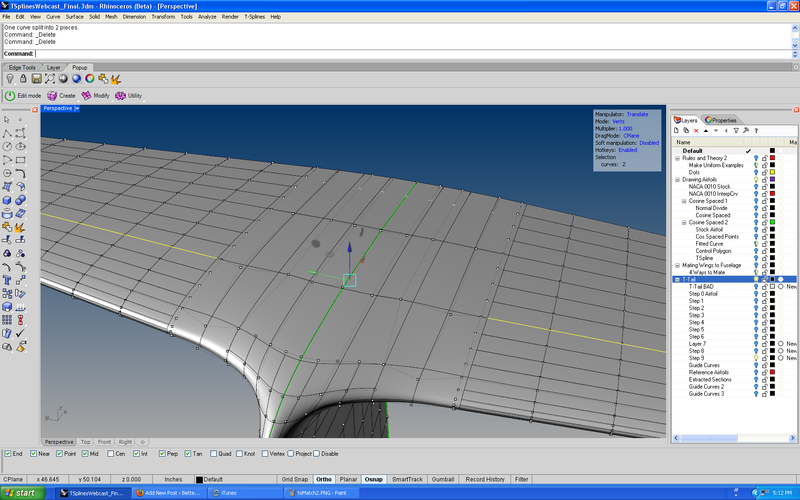 I wouldn’t expect this to show up next week, but if it’s possible I know that the folks at T-Splines understand just how powerful this type of functionality can be to really perfect a surface. This will create enough faces between your star point and your crease so that this is no longer an issue. As you can see, no more crease! Personally, I’d rather just use the BlendCrv trick shown above, because I never want to make my T-Spline any heavier than it possibly needs to be. So until it’s resolved, there’s two perfectly suitable ways of mitigating it. 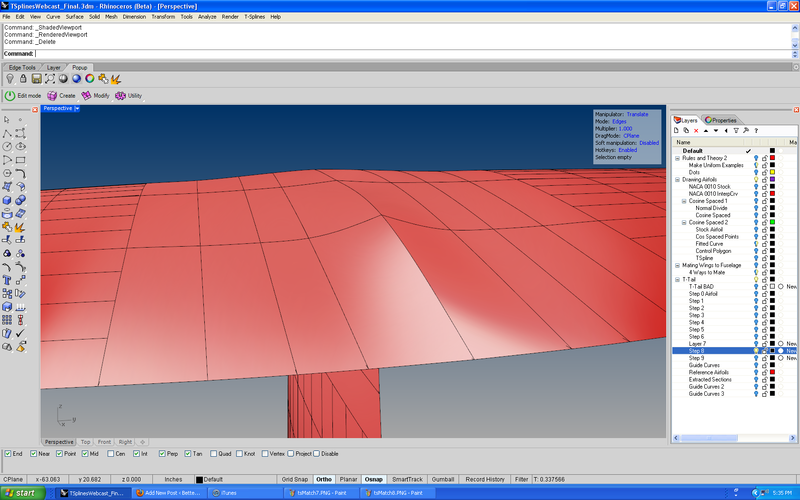 I’ve had some requests to show how I made the nice pointy tips on my model. I’m happy to share that, I’ll be posting in the next day or so a little how-to.